The Ben Youssef Madrassa was once an Islamic college in Marrakech named after Sultan Ali ibn Yusuf, who expanded the city considerably. This madrassa was one of the largest theological colleges in North Africa and may have housed as many as 900 students. After being closed down in 1960, it was refurbished and reopened in 1982, an interesting attraction for the value of its educational influence, but mostly thrilling for tourists because of the stunning architecture and mosaics. The courtyards and patios are richly carved in marble, cedar and stucco, with intricate geometric patterns and Islamic inscriptions. 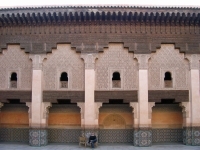 The Ben Youssef Madrassa is often ranked as one of the best attractions of Marrakech. Visitors can explore the student study rooms and dormitories. Luckily, photography is permitted, because it is one of the most spectacular buildings in Morocco. Although centrally located, the madrassa can be difficult to find, partly because various touts sometimes mislead tourists for reasons of their own, often trying to redirect them to family-owned stores and the like. It is better to rely on a good map and take directions from locals with a pinch of salt. Opening times: 9am-7pm (until 6pm in winter).